San Diego Gas & Electric is taking electric-powered transportation to a new level with the announcement Friday of a local charging network for trucks and industrial vehicles. The utility plans six projects that together will add charging stations at the Port of San Diego, San Diego International Airport, delivery fleet hubs and shuttle hubs to support semi-trucks, forklifts and other industrial equipment. Charging stations will also be built at four park & tide lots at the airport. “We are aggressively moving forward to help achieve the governor’s bold vision to have 1.5 million zero emission vehicles on our roads by 2025 to reduce pollution and stimulate the economy,” said SDG&E Chief Operating Officer Caroline Winn. 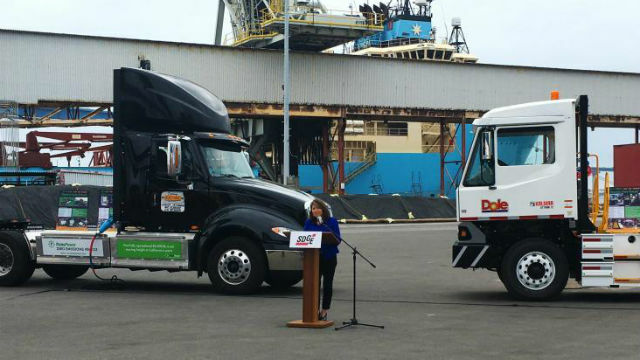 “Every car, every truck, every forklift that we can help electrify will move us closer to fulfilling that ambitious clean transportation goal that benefits us all,” she said at a news conference at the Port of San Diego. Partnering with SDG&E in the six projects are the port, port tenants such as Dole, the San Diego International Airport, and TransPower, an Escondido-based company that has supplied electric trucks to port tenants. The six charging projects were approved last week by the California Public Utilities Commission. SDG&E leads California utilities in clean energy, with 43 percent of power coming from renewable sources and no use of coal as a fuel.